Here at WoodStoveWizard.com I am aiming to compile the best resources for those who are burning firewood to heat their homes. If you think I might have missed something please do contact me using the form below; the site is continually being added to and I love to have feedback from my vistors. 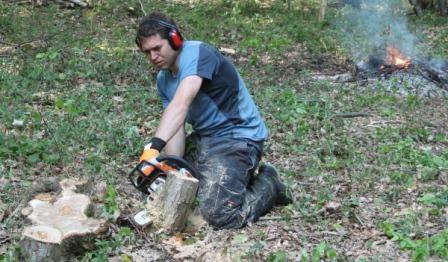 Me out in our woods on a day coppicing. In this shot I'm cutting a Hornbeam stump flush with the ground. This encourages healthy regrowth from as near the ground as possible.